Clayton’s Caps (Clayton Patterson and Elsa Rensaa). Hand embroidered. Undated. Clayton Patterson is an artist who wears many hats. Trained as a printmaker, he first worked in a fine arts print studio after his arrival in New York in 1979. His creative work has included just about every medium: sculpture, painting, drawing, photography, film, fashion, curating, journalism and publishing. When he took up video in the mid 1980’s, Clayton achieved fame as a pioneer in the use of the camera as a political tool. His video footage of the 1988 Tompkins Square Park riot helped identify police abuse but also brought him into the crosshairs of a retaliatory legal system. In the tattoo world, Clayton is famous for starting the Tattoo Society and successfully leading the battle to legalize tattooing in New York, which was only achieved in 1997. 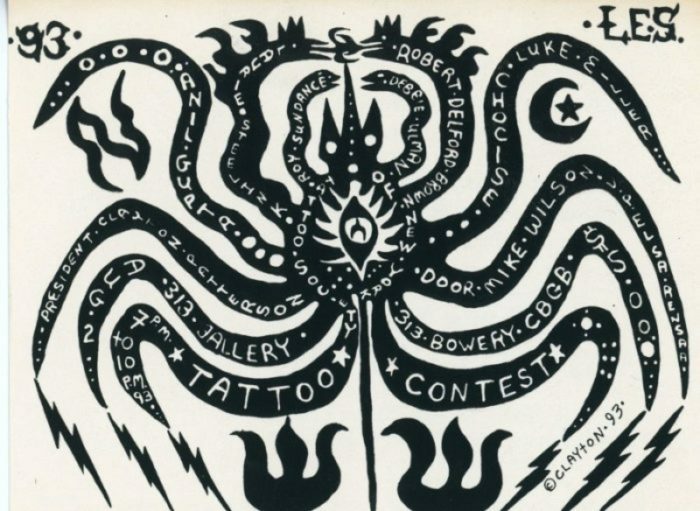 A proselytizer of the Lower East Side and its creative community of artists, Clayton founded the Outlaw Museum (1985) for outsider artists; published anthologies of LES history; and is the leading force of the East Village Acker Awards, a yearly event celebrating experimental art and politics. 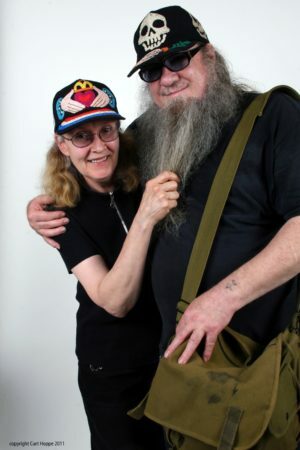 And to top it all, there is “Clayton Caps,” a collaborative venture that Clayton started with his wife Elsa Rensaa in 1986 as a creative way to make money. Featuring evocative motifs like skulls, clasped hands, hearts and roses, the hats are unique in the way multiple images are placed around the top and on the brim. The caps embroidered by Elsa bridge the worlds of fine arts and fashion. Today they are part of the story of 80s art, a period when other downtown artists like Keith Haring, Michael Roman, and Futura 2000 also experimented with wearable art. Custom designed and individually made, the hats were initially numbered, and fewer than 1000 were made. Gallery 98’s collection of Clayton Patterson ephemera includes all aspects of his varied career. A 1988 press release called for a protest outside the Center Street Courtroom when Clayton was arrested (for the twelfth time) for refusing to hand over his original Tompkins Square Park police riot footage. Publications include a copy of the Tattoo Gazette filled with his designs. Clayton’s documentary impulse can be seen in two original, signed color photographs: one of a leg tattooed with the signatures of famous tattoo artists (c. 1987) and the other a still life of drug paraphernalia (c. 1990).